There are a few places in Philadelphia that are known for their brunch. Green Eggs Cafe is most definitely on that list. Red Velvet Pancakes, Creme Brûlée French Toast… with options like these, it’s understandable why there is always a line out the door and around the corner. With four locations across the city (Midtown Village being their busiest, Northern Liberties a close second), there is absolutely no reason why you shouldn’t check this place out. Like I said, the line is always incredibly long- so keep that in mind when you go. I find that its easiest to get in on a random Tuesday for lunch or right when they open. We always make sure to get one of the French Toast’s for the table to share- they always have a special of the month (Carrot Cake French Toast? ), but for some reason, we’ve always gotten the Creme Brûlée… why mess with a good thing? For me, it’s way too sweet to eat just on my own, but for those of you who have a big sweet tooth, this is just for you. 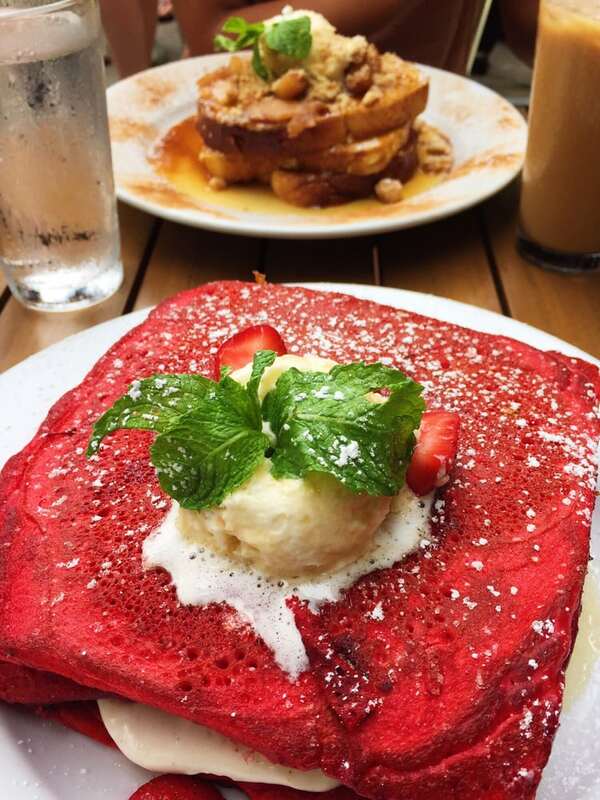 They also have Apple Pie French Toast and Red Velvet Pancakes, so your sweet tooth is sure to be satisfied. For other brunch options, they have the “Kitchen Sink”- three eggs scrambled with sausage, cheese, peppers, and onions, topped with a biscuits and gravy. You will definitely need a nap after. I personally think their breakfast burrito is one of the best I’ve ever had. They have your traditional bagel and lox, tofu scramble, various eggs Benedict, and for those of you who want to be healthy, a granola parfait. Looking for a lunch option for brunch? The California Turkey panini is a sure winner- with roasted pepper jack cheese, avocado salsa, tomato, alfalfa sprouts, and a vegan basil aioli. Craving a burger? Don’t worry, they’ve got that too. But the crem de la cream, the icing on the cake, the true show stopper here is their buffalo chicken mac and cheese. The chicken strips are super crispy, and they’re flavorful without being too spicy. The mac and cheese is gooey and creamy, and combined, it’s hands down the most amazing food combination I have ever had. I guess what you can take away from this is: nothing you get at Green Eggs will be bad. But take note- besides being cash only, you will walk away with a full stomach, and most likely need a nap and or a gym session shortly after. It’s beyond delicious, yes, but it is most certainly not for those looking for a light meal. (I tried once with that granola… I ate half the French Toast that day as well).